What is the draft hood, how does it work, instructions on how to install it on the atmospheric-vent gas water heater, problems you can expect and solution. All water heaters that are powered by natural gas or propane require a venting system - to remove the exhaust gases out, including dangerous carbon monoxide. The simplest and most affordable type of all gas water heaters is the atmospheric type. Atmospheric-vent water heaters use a metal pipe and chimney, and is often terminated on the roof, transferring products of combustion (flue gases) to the outdoors. It doesn’t use the electric blower as the power vent, but the natural convection. During the installation, it is important to provide a vertical or upward sloping vent so the hot fumes can rise quickly to the outside atmosphere. The height of the vertical section and temperature of the exhaust gases are important to create an efficient draw and an upward gas flow. Every gas water heater with the atmospheric venting system is equipped with the draft hood, an element that is located on the top of the heater, connecting the heater with the venting system. The draft hood is designed to cool the products of combustion and transfer it safely from the combustion chamber to the venting system and out. It also protects the heating operation during updrafts and downdrafts caused by indoor and outdoor air pressure differences. On the top of the draft hood goes the metal flue exhaust. Depending on the model, the draft hood accommodates 3" or 4" vents or both sizes and is designed for single or double-wall vent (galvanized) pipes. 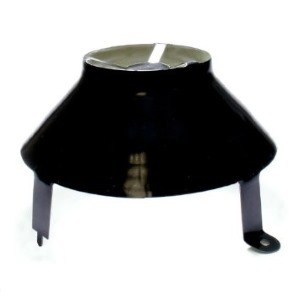 In a case of the double-wall vent pipe, the recommendation is to install the Type B draft hood connector. A vent pipe connector should also be used if the vent pipe has a larger diameter than the draft hood. A gas water heater can use one of the two draft hood types: lock-in and push-in types. Both types are easy to install; the first one uses the slots so the draft hood legs can be securely locked-in, while the other one is secured with the self-drilling screws (usually provided). If the screws are not provided, the recommendation is to use 5/8" long screws or shorter. Three screws, evenly spaced work the best. While installing the vent pipe over the draft hood, you must secure the connection with the sheet metal screw. The size of the vent pipe must not be smaller than the draft hood, and connection must be airtight to prevent the leak of the flue gases. Some adjustments might be needed as long as the original size and shape are kept. The draft hood installation must be done per manufacturer instructions and codes. To test the draft hood for the appropriate operation, it is recommended to depressurize the house. Close all the doors and windows and let all the fans inside the house working (clothes dryer, range hood, bathrooms fans and other). Take the match and lit. Hold it close to the draft hood. If the match flame/smoke gets into the draft hood, venting is operating as it should. You can also use the glass or mirror, and if it gets fogged up, the flue gases are escaping the venting system and are going into the house – not good. One of the most common problems due to the improperly designed and installed vents is backdrafting. Backdrafting is a result of the insufficient draft, so gases are coming back into the house. An excessive draft is also a problem as it can lead to higher than normal noise, sooting and poor burner performance. In addition to venting the flue gases, every gas water heater that is installed in confined space needs an air supply for the proper gas combustion. Combustion and ventilation air could be supplied from inside or outside the house. It is recommended to have the professional plumber install the water heater and its venting, following the manufacturer’s instructions and building codes. Don’t use the draft hood from the old heater or different model. Each model is supplied with a specific draft hood. Don’t modify, cut or change its original shape during installation. Don’t block the draft hood and area around. Don’t place any object in the proximity of the draft hood. Don’t install any other vent type, except recommended. Don’t use any other material of the vent except recommended. A vent pipe should be made of galvanized steel.